The Impact Dynamics Research Facility (IDRF) shown in the picture above was originally known as the Lunar Landing Research Facility (LLRF) in the 1960s. This was one of the locations where NASA utilized tethered landers to train the Apollo astronauts for moon landings. If you visit the image links below you will learn that this facilty has a rich and varied history. The LLRF is one of several National Historic Landmarks at NASA Langley Research Center. All photos are courtesy of the NASA Technical Reports Server (NTRS). (1964) An early photo of the LLRF. (1967) A progression of Landing Simulator photos. (1967) The Pogo Test Vehicle at the LLRF. (1968) An Apollo Program Image. (1968) The United States Flag against the backdrop of an Apollo Saturn 5 rocket launch. (1968) Earthrise as seen from lunar orbit. (1969) Astronaut Neil Armstrong training at the LLRF. (1970) The late Astronaut Alan Shepard training at the LLRF. (1972) The Lunar Rover on the moon. Radio Systems Status as of 2014.04.07 at 1400 EST. 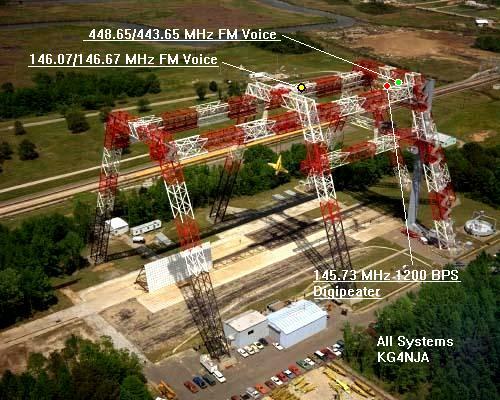 Due to the RF-rich environment of the gantry the repeater will normally be on 173.8 Hz carrier access only. There is currently no tone on the repeater transmitter. Please read the NLARC Repeater Guidelines & Commands document for complete information on approved operating procedures. 2014.04.07 - An On-Air Presentation of 'A Few Relatively New Subjects in Amateur Radio, Short Wave and VHF Scanner Listening'. For previous items, check the previous history list. (On-going), you are invited to join the York County/Poquoson ARES net that meets on Monday nights at 2000 hours on 146.07/67. For previous announcements, check the previous announcements list. The NASA Langley Amateur Radio Club (NLARC) is sponsored by the Langley Research Center Exchange. Resources to support the NLARC are derived from it's membership and other parties interested in supporting Amateur Radio operations. NLARC membership is open to all NASA employees, their spouses, retirees, LaRC contractors and in some instances, dependents. If you would like to join the NLARC and receive a NLARC roster, please contact Jim Byrd or call 757.864.5961. The NLARC has a long history beginning in 1962. The NLARC repeater systems are installed on the IDRF gantry that is used by the Impact Dynamics Research Branch. Here is an aerial view of NASA Langley Research Center. The NLARC repeaters are located on the IDRF gantry, about one mile distant in the center of the image. A southeast Virginia regional map position of the NLARC repeaters. The The National Weather Service Forecast Office in Wakefield Virginia. The Tropical Prediction Center of the National Hurricane Center. Today's Space Weather from the Space Environment Center. The Peninsula Amateur Radio Club (PARC) of Newport News, VA. The Williamsburg Area Amateur Radio Club (WAARC). The Eastern Virginia APRS Group (EVA). The Middle Peninsula Amateur Radio Club (MPARC) (the Gloucester/Middlesec Co. region). The Virginia Beach Emergency Amateur Repeater Society (VBEARS). The Virginia Beach Amateur Radio Club (VBARC). The Eastern SHore Amateur Radio Club (ESHARC). Tidewater Radio Conventions Inc. of Virginia Beach. The Portsmouth Amateur Radio Club (PARC). The Fessenden Amateur Radio Society (Buxton, NC Outer Banks). The Western Tidewater Radio Association (WTRA). The Richmond Amateur Radio Club (RARC). There are more, let us know who you are. The Virginia Digital Emergency Network. The American Radio Relay league (ARRL). The Federal Emergency Management Agency (FEMA). The International Space Station Reference page explains how Amateur Radio is involved in the International Space Station. ITU Region 1 is generally all of Africa, Europe, Northern and Central Asia. ITU Region 2 is all of North and South America. ITU Region 3 is Southern Asia, Australia, including most of the Pacific Islands. The Spaceflight Now news site. The NASA Television home page for program schedules and news. The SPACEWARN Bulletin. Official bulletins for desiminating information about satellites and space probes. The Basics of Space Flight learner's Workbook from the JPL. The Educator's resource NASA Education. This section is set aside for Web experimentation.